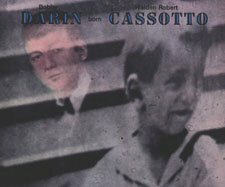 BobbyDarin.net/BobbyDarin.com - "Bobby Darin Born Walden Robert Cassotto"
Bobby Darin Born Walden Robert Cassotto was an artistic triumph for Mr. Darin. The following is stated on the back of the cover: "This album was written, arranged, produced, designed and photographed by BOBBY DARIN." The LP got attention from The Los Angeles Times and showcased Darin's writing talents more than his singing. "Long Line Rider" was released as a single and reached #79 on the billboard charts, and "In Memoriam" was a tribute to Robert Kennedy. The LP's cover is interesting, with lyrics on the inside of the gatefold, and poetry by Mr. Darin on back. This LP was soon followed by Commitment (also on Bobby's own label, Direction) when Bobby changed his name to "Bob" Darin. Many people feel this phase of Mr. Darin's career was overlooked. His lyrics were inspired, and the results were pure genius.